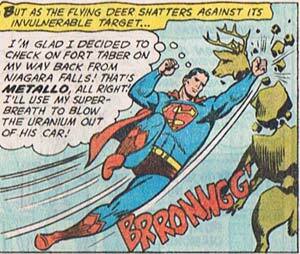 Random Panel: No one shares the skies with Superman, not even SANTA! 5 Responses to Random Panel: No one shares the skies with Superman, not even SANTA! So a reindeer goes “BRRONNG!” when shattered… who knew? No, look at the position of the BRRONNGG!, that’s the sound effect of something else. This is another one of Jeff’s random crotch shot panels. I mean seriously super-gas AND heat vision? Why even break a sweat?